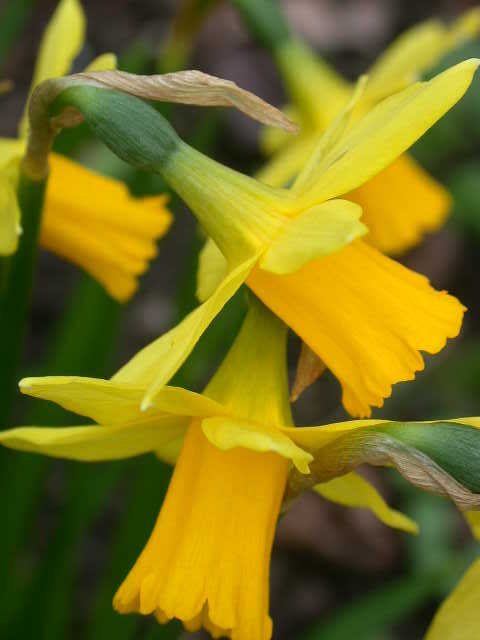 Daffodils are available between May and November from our Autumn Catalogue or you can buy in season from our Online Store. Having spent the last 26 years running Broadleigh Gardens, a name virtually synonymous with smaller daffodils, I am still amazed, a few honourable exceptions apart, how neglected they are as garden plants, particularly by alpine gardeners who seem to concentrate on the species and neglect the smaller hybrids. 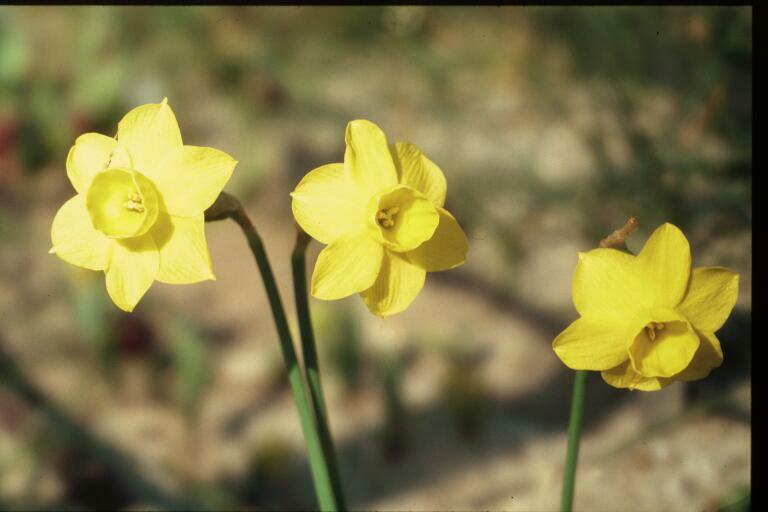 Alec Gray, a Cornish cut flower grower, began his lifelong interest in daffodil breeding in the 1930’s when trips to S Europe introduced him to the possibilities presented by the species narcissus. Although his initial aim was to add naturally earlier flowering varieties to his commercial stock, the grace and charm of the delicate hybrids he produced soon became his principal objective. 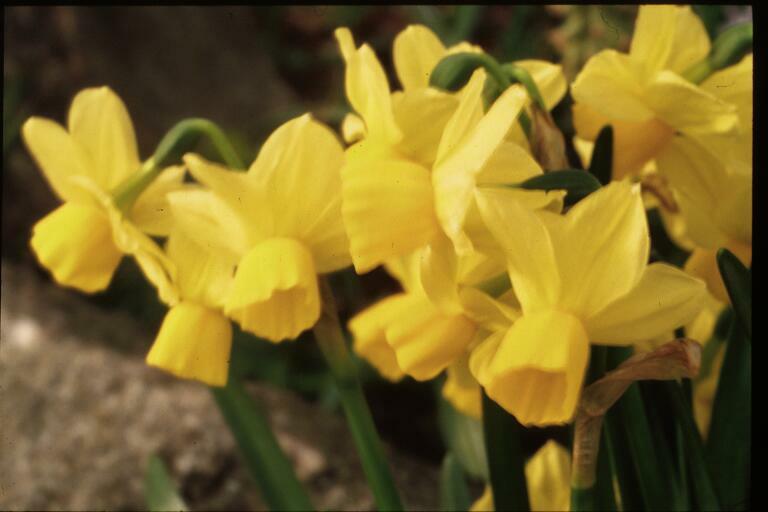 ‘Tete a Tete’ and ‘Sundial’ remain two of the most successful small daffodils to date. His mantle then principally passed to the USA and today there are a host of garden worthy miniatures to chose from. Our nursery stock currently runs to over 250 varieties, varying in stature from tiny 6cm species to 34cm hybrids. Not all, of course, are suitable for the open garden but many appreciate similar conditions to plants grown by the alpine gardener and they make excellent companions provided they are matched for proportion and scale. Short supply is more likely to be the limiting factor rather than choice. The first principal is to remember that many of the hybrids are only one or two generations removed from a species parent. Successful cultivation is therefore more likely to be ensured by a consideration of their respective climatic requirements. This is particularly true of those originating in S. Europe or N. Africa which experience a mild winter and a hot dry summer – especially the jonquils and tazettas. Not only are some borderline hardy others will only flower well if given a warm, dry summer dormancy. This was dramatically illustrated on the nursery this year. 25 years ago we were given a pot of jonquils collected by Frank Waley and Stocken. These had never flowered and Frank thought we might like the challenge. Although it grew well under our usual regime “Stocken” still steadfastly refused to flower. In desperation I planted some in my bulb frame, which is kept considerably drier in summer, and where it finally rewarded us by flowering profusely. It has been provisionally identified as N. willkommii. 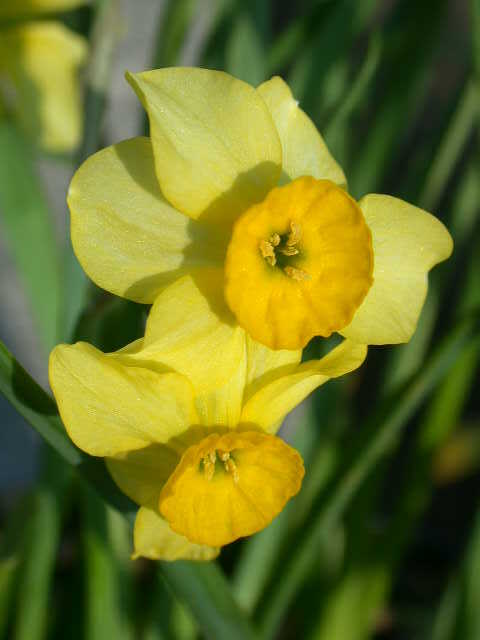 We have found that the really tiny jonquil hybrids, particularly John Blanchard’s ‘Sabrosa’ and ‘Pequenita’ are best given a similar treatment although the slightly taller hybrids such as ‘Sundial’, ‘Clare’ and ‘Sundisc’ are much more vigorous and make excellent garden plants. Although they are too tall to be grown among the smallest alpines they are the perfect companions for the slightly more robust phlox etc. They revel in a well drained, sunny site and one of the most striking- the white and yellow ‘Segovia’- is grown in the open field here. The dwarf tazetta species known as N.canaliculatus is only really hardy in the south of Britain and certainly flowers best in a sunny, well drained soil. The similar, cream coloured hybrid ‘Minnow’ is much more amenable to general garden conditions. By contrast we virtually lost the entire stock of one hybrid by ignoring our own rules and killing it with kindness. As the stock was so small we planted N. Eystettensis (Queen Anne’s double daffodil) in the troughs that we use for our most vulnerable varieties. Here, instead of thriving, it gradually dwindled, unlike a clump in a cool woodland bed that continued to steadily increase. 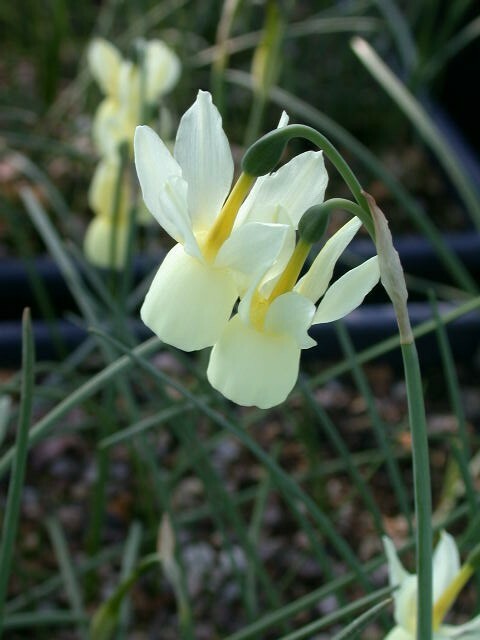 N. Eystettensis is one of the oldest narcissus still in cultivation and is a member of the pseudonarcissus section. 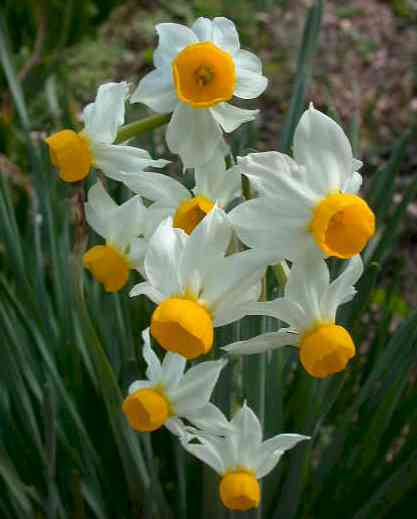 These are principally trumpet daffodils. Although they are probably the most adaptable of all the daffodil groups they prefer cool woodland conditions where they are usually long lived. Even the smallest trumpet hybrids are best grown under these conditions. The tiny ‘Gipsy Queen’ grows and flowers freely at the base of a hawthorn in company with Corydalis flexuosa. The most perfect of all miniature trumpets. N. asturiensis, has a reputation for being shortlived in cultivation but my clump has flowered happily for 25years in a relatively dry acid soil under a large Pieris. Sadly though it has refused to set seed and has shown little inclination to multiply. Although at first glance they could not be more unalike N. cyclamimeus is also a member of the same section. With its completely reflexed perinath it needs little introduction and is best grown in an acid soil that is not too dry, especially in spring. As experiments at Rosemoor Gardens have shown it will grow in grass, but my experience is that it prefers a border. 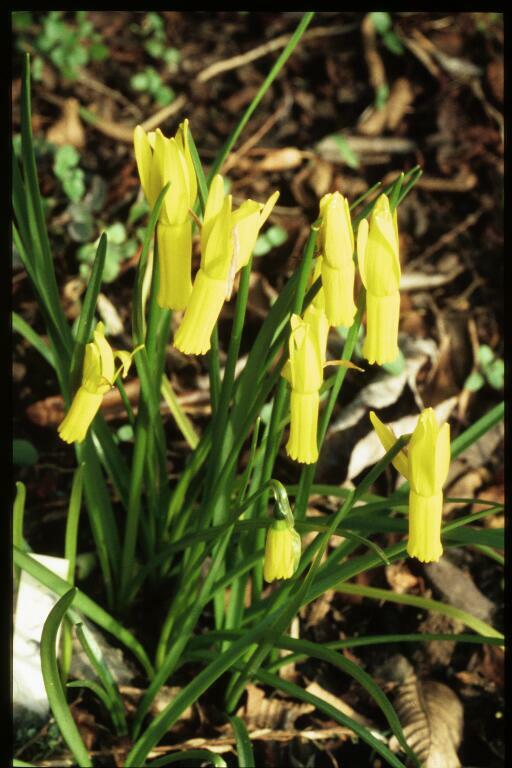 Like many species the bulbs themselves only rarely increase but they grow freely from seed, flowering in 3-4 years, rather than the more usual 7. It is also one of the few to produce natural hybrids in the garden and one of the easiest to hybridise. 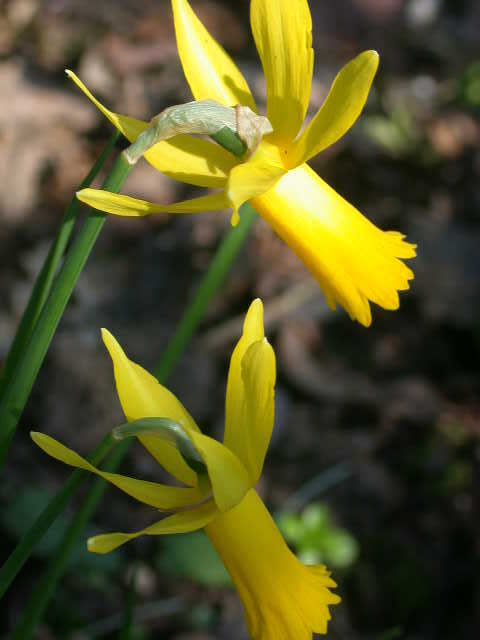 A careful examination of the individual flowers at the Savil Gardens will reveal many self sown hybrids between N. cyclamineus and other daffodils, principally forms of N. minor and N. pseudonarcissus. Some are rather crude, with barely reflexed petals while others have a grace and charm similar to that of N. cyclamineus itself. However tempting it is, these crosses should not be given the name ‘Mini-cycla’. This can only be applied to the specific hybrid between N. asturiensis and N. cyclamineus registered by F. Herbert Chapman in 1913. Although this charming 8cm miniature is reputedly not fully hardy it has steadily increased for many years in my rhodo. bed. However I find it very tempermental in pots as it seems prone to basal rot. The similar, though taller N.’Mite’ is gradually becoming available and has proved itself very vigorous with me, although it too does not like long term pot culture, preferring the open garden. The tiny, bicoloured N. ‘Mitzy’ appears very fragile but does well in similar conditions. 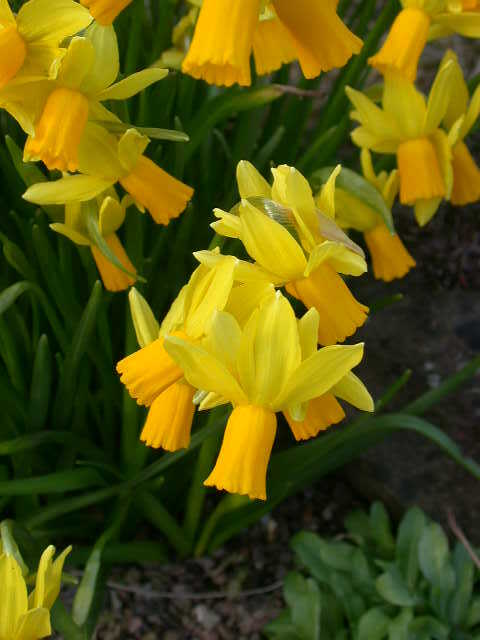 The slightly more robust trio – ‘Tete a Tete’, ‘Jumblie’ and ‘Quince’- now reclassified as Division 12 (other daffodils), still show their cyclamineus parentage and perform best in the cooler part of the garden, often being relatively short lived on dry, limey soils. Producing a new plant is one of the most rewarding aspects of gardening but requires a large amount of time and patience. N.cyclamineus is probably the easiest narcissus to hybridise and one of the best for beginners as the seedlings flower satisfyingly early. Seed should be thinly sown in an open, loam based compost with added moss peat. Once the seedlings appear they should be regularly watered with a dilute tomato fertiliser and will be ready to plant out in their third year, when they will also begin to flower. The dry pine litter of Central Spanish mountains is the natural home of N. triandrus. Although relatively easy as a pan subject it is only really happy in the open garden in a dry acid soil. The only expanding colony that I know is in light grass under a huge oak tree. This soil preference has been inherited by most of its first generation offspring. N.’Hawera’ and the similar N.’April Tears’, usually struggle after a couple of years but planted among rhododendrons they take on a whole new appearance, proving vigorous and extremely floriferous. N. ‘Petrel’ is like a slightly larger white ‘Hawera’ and seems more adaptable.Of the other smaller hybrids we have found ‘Mary Plumsread’ the easiest, although we have not tried it in the open garden. The intermediate triandrus hybrids such as ‘Dawn’ and ‘Harmony Bells’ are a little too tall for all but the largest rock garden although I use them successfully among Trilliums and other woodland plants under shrubs. The Christmas flowering white bulbocodiums are not really happy in the garden. We have succeeded for a short time in a trough but inclement weather usually damages the flowers and the bulbs gradually dwindle. The later flowering golden varieties are much easier, In the wild many are snow melt plants and all require plenty of moisture as they grow. At Marwood Hill they are virtually growing in a small, seasonal stream and both the famous alpine meadows at Wisley and Savil Gardens have a high spring water table. Despite their apparent vigour N. bulbocodium can be quite difficult to establish as bulbs planted directly into grass do not always suceed. 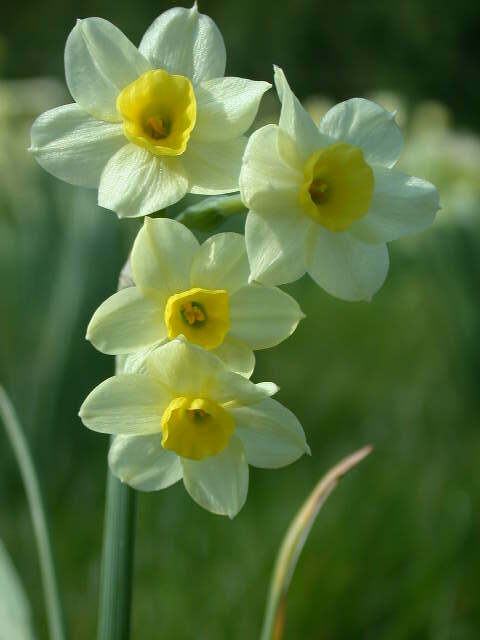 We have had more success by putting 1-3 bulbs in a 9cm pot and then planting them out, soil and all, in the spring. Fritillaria meleagris has also been established in a similar way. If self sowing is desired then the grass must be left uncut until the seed is ripe and has been dispersed. Alternatively seedlings can be raised in trays and grown on to flowering size. Most of the N. bulbocodium listed in catalogues are selections, so far I do dot know of a bulbocodium hybrid, such as ‘Kenellis’ that is truely gardenworthy. Sadly most seem to decline when planted outside. All pictures on this site © Christine Skelmersdale are available for licensing. All rights reserved.